In addition to our solar powered Center we have supported a number of other solar installations in Golu and beyond. A reliable source of power is the foundation for other development efforts. In early 2016 we upgraded our solar power at the center so we ended up donating a small portable solar power unit to Golu's health center to allow for safer night time births. 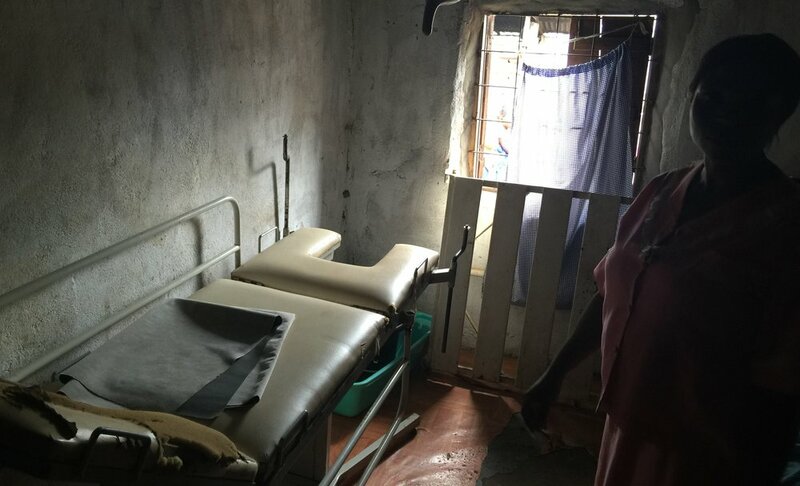 We've heard reports from the nurses that this small solar unit has play a major role in minimizing complications during the birthing process for the mother and baby - creating a safer environment for the nurses and women in the community. Outside the Golu health center. One of the nurses in one of two rooms where they deliver babies. In January 2016 we were in Sierra Leone and decided to take the young girl that TVL sponsors to her boarding school in Moyamba. On this trip we were told that as part of her school supplies she needed kerosine and a lamp so that she could have light while studying at night or to use to find her way to the bathroom. Immediately we felt we installing solar at the country’s only all girls boarding school in Moyamba. The June Hartranft Memorial Primary School for Girls has over 400 students and before TVL had no power source. The girls had to use kerosine to eat, study and go to the bathroom at night. The solar we installed is providing a cleaner energy source and it’s much safer for the girls. It also cuts down on the expenses for the girls families. Millicent Fillie - TVL's female student sponsor excited for solar to be installed at her school. TVL visiting with some of the students and teachers of the June Hartranft Memorial Primary School. The thing about development work is that sometimes it's pays to think outside of the box and help in areas that may not be your core focus. We try to stay focused on our core mission but after a recent upgrade to our Center's solar equipment we decided to donate our first set of solar equipment to the Mosque. This was an act that helped to further deepen our bond, trust and relationship with the people of Golu.